– It’s been a barn-burner of an early season. It’s spawn urgent questions galore: Will it ever stop snowing in Europe? How injured is Heinrich Haussler’s knee? How steep is too steep? Will Boonen break through at Milan-San Remo? Whose fault was it -- Sanchez or Le Mevel? What member of Ricardo Ricco’s family will test positive next? What does Leif Hoste dream about when he dreams about summer? And, most hotly debated of all, just how extensive is Linus Gerdemann’s moisturizing regimen? For a PRO with a not-unimpressive palmares, he has the most precious face in the peloton. 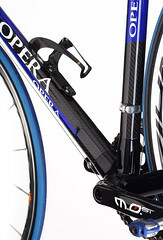 – A bike brand I dig: Opera Bike. It’s a thinly-veiled sub-brand of Pinarello. It was born in the early 2000’s when Pinarello was still strictly a steel and aluminum outfit. They wanted a means to produce & sell frames made from other materials (read: Ti and carbon) back when the Italians still viewed these as new-fangled and possibly impermanent-in-the-marketplace. 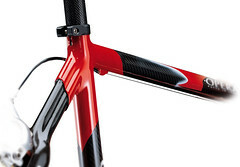 In order to protect Pinarello brand integrity, they banished them for use in Opera Bike only. Let the record show, too, that the post-Banesto/pre-Caisse d’Epargne team known as Illes Balears rode Opera Bike, most famously by Vladimir ‘Shaggy’ Karpets to a White Jersey title in the 2004 Tour de France. So, anyway, if/when you see an Opera Bike Giorgione or Leonardo in the classifieds or on Ebay, dig the fact that it’s really a Pinarello, dig its lineage, and dig the fact that you’ll get it cheap because you’re now one of maybe 50 people in North America that know the goods. Unfortunately you can’t walk into your local Pinarello dealer and buy a circa-2010 Opera Bike because Pinarello has no idea of what they’d like to do with the brand….Hey -- maybe we can buy it? Remember how we were talking about private label here last fall? Opera Bike would be a totally PRO brand to snag. Luciano, give me a jingle! We prefer to remember April 1986 for what you see below instead. And make sure to dig on the almighty PRO hardness of Gilbert Duclos Lasalle at 0:22. – I RSS the Rapha blog, but it’s a painful experience clicking through. Why? Few websites out there load slower than Rapha’s. A question for the US audience: Is it slow to load for you as well? I’m guessing it’s b/c it’s hosted out of the UK. I wonder if CDN is an option for them? Is CDN to the point where it’s affordable for small (or small-medium) web-based companies? – Your local bike shop probably has a website. It’s probably driven from templates designed by a company known as ‘Smart Etailing.’ Look, for example, how this site shares the same vibe as this one and this one. These sites doubtlessly possess useful local info for their respective cycling scenes. And while the presence of a shopping cart on these sites makes them putatively functional for e-commerce, their homogeneous design & voice probably results in a total online income (aggregate for all Smart Etailing-driven sites) at/around change-between-the-couch-cushion levels. Other than Ebay, there is no successful means for your local bike shop to generate real income from the web. Which is why HABS is a bit interesting. It looks like a centralized place for local bike shops to dump inventory overstock. I’ll be curious to hear if anyone actually uses it, and whether you’ll see much beyond XS women’s sleeveless jerseys and 49cm Tiagra bikes. And if there is indeed high-quality inventory there, I wonder how long it’ll be ’til the behemoth brands put the clamps down hard on the shops who participate. Props to HABS for trying to be a market-maker. – Speaking of online sales, interesting news this week that Reynolds Composites is now selling their wheels online, direct-to-consumer. This makes perfect sense, and it’s likely the direction of the entire bike industry since both data and anecdotes confirm that brick-and-mortar bike retail continues to be pummeled by the recession. But, as we say around here, God bless the early adopter. As of now the number of manufacturers selling big-ticket items direct-to-consumer is tiny. We don’t doubt that Zipp, HED, Fulcrum, Easton, et al, will make fully clear to shops that Reynolds is now competing for their customers. And from the Dept. of ‘True, True, Unrelated’ is the fact that the guy we’ve long seen as the heart & soul of Reynolds, their sales director Jonathan Geran, resigned from the company within 48 hours of the consumer direct announcement. Best of luck both to Jonathan & to Reynolds.